Hey John, I like the way the darkness is visible when looking at the heart, but it also allows the light to shine through. Symbolic? 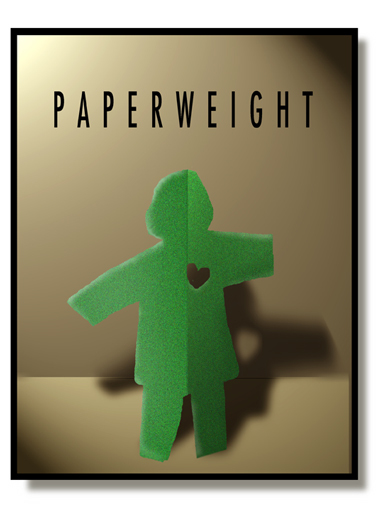 I thought the intense light play gave the paper doll a dramatic feel. The heart shape emphasizes the light source. It's definitely meant to be interpreted as a metaphor for love. The cover could be an allegory for Obama's intellect rating if boxing weight classes were configured to represent brain power. However, the "heart which isn't" should be shedding crocodile blood. It clearly evokes children, too, in a cute way that grabs you. It feels both light hearted and heavy hearted at the same time. Even ominous. Given its simplicity, it is surprisingly emotive and complex. When I see one of these book cover pieces, I've started the habit of attempting to figure out what the referenced book is about. At first I thought these were fictious titles, but no! they are real books. "Stephen Fry's Paperweight provides well-thought arguments, witty jabs at deserving targets, and most importantly lots of laughs. Out-loud-laughs. Do take this book on the bus. This is a collection of various articles, reviews, and radio sketches (plus a play), all easily digestible and quick reads - a good thing, since you'll want to read them over and over. (If you're looking for a present for an associate, score some brownie points and get them Fry's Paperweight instead of the traditional glass one!)" But the title is leaving me wondering if it refers to the book being made of stuff typically found under a paperweight, or if the individual pieces in the book are as light as the weight of paper, or the humor makes it seem so. That said, I like the piece, will probably have to read the book to understand the art. The titles I come up with invariably pop up as actual titles for published works. I used to try to come up with titles that haven't every been used.....TOUGH! So, instead sweating the cover being thought of as a cover idea for ANOTHER such titled book, I give myself license to pick the most evocative words that suit the illustration and forget about that prospect of an utterly original title. These pieces merely demonstrate my illustration craft, not my writing skills. If I happen to use words that appear on other works just remember it's about the illustration not the prospect of creating an actual tome. This page contains a single entry from the blog posted on March 22, 2011 1:43 AM.